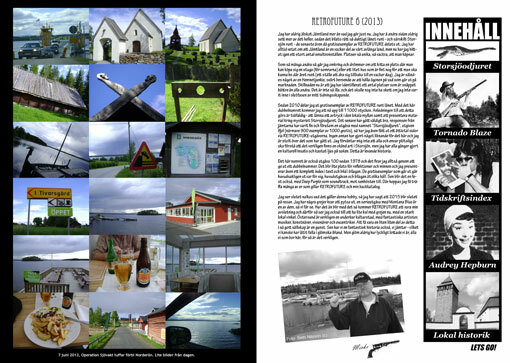 Here is another preview from the upcoming RETROFUTURE 6 (Western edition) issue, a two page article on a very special place in my County Jämtland, Brunflo church and its defensive tower (called a “Kastal” here). At this site (and in villages close by), in 1644, a Swedish army finally settled the endless disputes over this land with Norway, and Jämtland has belonged to Sweden ever since. I enjoy to add little things like this into the magazine, just some quick history to remind us all of our past. My County Jämtland has got a long and rich history. Located on the island of Frösön in Lake Storsjön (The Great Lake) is this wonderful runestone, dated to ca 1030-1050. The runes have been translated to mainly be about the fact that Jämtland was Christianized at the time and how a bridge was built in the narrow straight a thousand years ago. There is a twist. 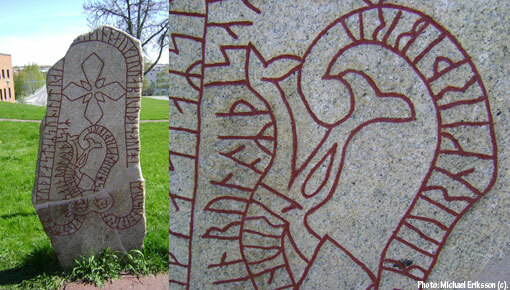 As you can see there is a dragon´s head in plain view and there is no other runestone in Sweden depicting such a thing. This runestone originally stood right at the shore, close to where the bridge would have been (there is a bridge at roughly the same place today as well), and we do have the mystery of The Great Lake Monster in this very lake. A local vicar wrote about this as early as 1635 when he put some local legends down in writing, which has survived and is now famous. The Great Lake was connected to the sea 9000 years ago so any kind of large sized animal (family) that has made it through the years must have a local history that is at least that long. In my view, there is no reason to believe that this mystery suddenly popped up 400 years ago, although it was first noted in a way that has survived then. Could it be then that this runestone simply depicts something that everybody who lived here knew of even back then? The interesting thing is that it seems to be chained by a lock as well. Nobody really wants to talk about the runestone in this manner. I can understand that. But I think it is reasonable to keep an open mind regarding this stone and it might even be prudent to accept that we will never know the full story. All we can do is marvel at the fact that it still stands, close to where it once stood, for all to see. Well, this shot was taken from my balcony an hour ago. Heavy rain, lightning and roaring thunder. I actually kind of like it. I had to wait a bit for the worst to pass before going online, but for some reason I wanted to present a little snapshot of my view in this weather. The holiday is coming to an end, normal life kicks in on tuesday night again. I don´t really mind too much, I have had a good rest and I am grateful for that. I have relaxed but I have also been quite busy. You have seen little glimpses of my life on this blog (but limited to what I want to share, it goes without saying). I enjoy this blog though, I think it is what I want it to be. It has roughly 45 to 60 visitors an hour. I think that is pretty good. I don´t know who´s visiting really but if somebody enjoys it every now and then, fine. 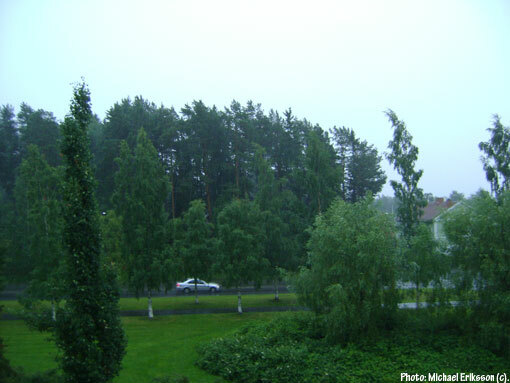 The thing about Sweden, in case you didn´t know, is that everything comes to a halt in June, July and August (the summer months). When the rest of the year is characterized by poor weather (or worse, freezing winter) that´s just the way it is. People need to enjoy a bit of sun. The arrival of RETROFUTURE 6 (Purple edition) when everything was in this state (closed schools, everybody on holiday), was not good. But interest will pick up as people go back to their normal lives. The Western edition is coming along nicely and I think it will be one of the best publications ever. As long as one think one has done well, everything will be OK. I know this is a good issue, looking forward to its publication. In the end, I think that I will eventually be able to look back at 2013 and what I have achieved with this hobby of mine with a smile. Fair enough. 100 issues is not bad, it was worth a bit of an effort. It marks the beginning of the end of the hobby though and there will be at least a 10 month break between the RETROFUTURE 6 issue and the next (whatever that might be). To me, that is like a holiday in itself if you can believe that. Looking forward to it. Still, pretty excited about 2013. The hunt for the truth is on regarding the Great Lake Monster of Lake Storsjön (The Great Lake) and as always RETROFUTURE is where the action is. I had so much stuff for RETROFUTURE 6 that I have had to put some aside for later, but here is a preview of some of the material that is coming up this fall. Nobody else is doing this in this manner and this is also the main reason why I have given away so many magazines for free here in Jämtland (county) around this lake in the last few years. It has generated an interest that has been quite interesting. I meet people all the time now that want to talk about this subject, at work, on pubs, even on my way home from work one early morning when I popped into a gas station to pick up a package of books. The project has produced a wealth of new material and I have also re-printed archive material (reports) from the 1895-1910 period in great numbers. The phenomenon is old and still going strong. I am proud of the work that has been done and I know that many people are astounded that I have had the guts to do it. 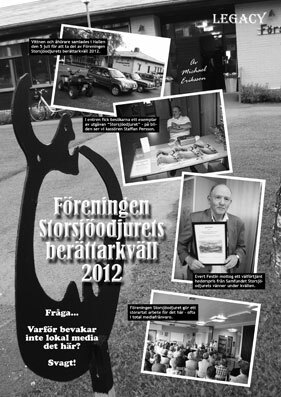 I met a friend a few weeks ago who said that he had sent a copy of my magazine “Storsjöodjuret” (“The Great Lake Monster”, published last year) to a cousin in the south of Sweden who is also an author (I don´t remember the name). He said that this man had brought up the subject several times and that he had said that he had read the publication several times over. Best feedback I ever had! Also, a Professor in Zoology at the Stockholm University showed interest (and bought a copy). On top of this, a leading newspaper, Dagens Nyheter, gave a very positive review. Local media has been quiet. And things are moving on too. I just had a conversation with Evert Festin, one of the leading figures in the field and he told me that this years gathering with Föreningen Storsjöodjuret (a local group that is very active) will take place in a village called Hara on August 26. What they do is, they have this annual meeting that is open to the general public (on different locations around the lake each year) – with many witnesses that are brave enough to speak about what they have experienced. Every single year, somebody in the crowd comes up and owes up. A couple of years ago, I witnessed an old lady tell her story six decades (I think it was) after it happened. 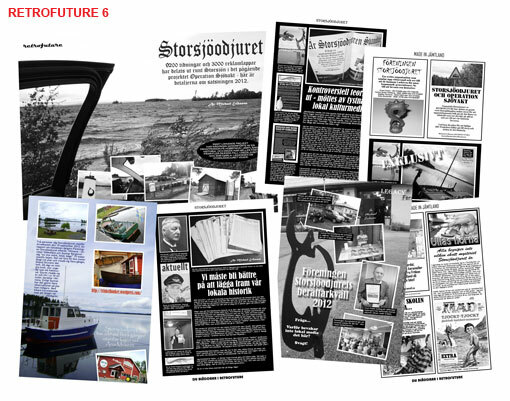 The page seen here is a RETROFUTURE 6 preview from last years meeting that took place in Hallen on July 5 2012. Local media does not cover this scene, a remarkable fact that is hard to understand. Basically speaking, they are afraid to touch it, God forbid that they should ever risk their precious reputations. I may write a book in English on the subject some day. This is a mystery that belongs with the famous cases and the information we sit on here just isn´t out there. I think it should be. I will touch on the subject every now and then on this blog. This is real, this is ongoing and this is here to stay. 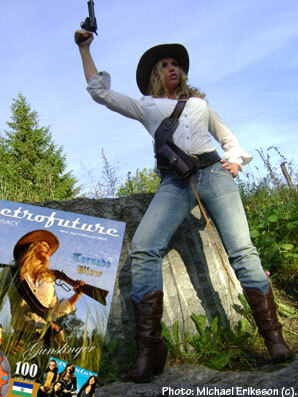 I have picked up work on RETROFUTURE 6 (Western edition) again after having taken some time off during the holiday, and today I updated page 2 (as seen here) and used images from our trip to Norderön in early June (as seen earlier on this blog). I realised that these images went so well with the introduction on page 3 for this issue, so I had to change it. All in all, RETROFUTURE 6 (counting both editions), will eventually be a strong 104 page collection. 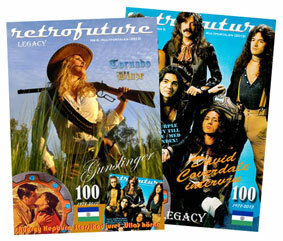 For a fanzine publication that is pretty impressive, but then you don´t celebrate 100 issues every day. I need to end this in a good way and I think I am. I thought I would show you a preview of one of the pictures that will be printed with the second (and final) part of the Tornado Blaze novel that is due to be published in RETROFUTURE 6 (Western edition) in a few months time. I show it to you in full colour here, but in the magazine it goes out as a full page in black and white. I like this shot and it goes well with the big showdown in the novel. I have added a new category called “My western gals” to the blog, so that you can find that stuff a little quicker. I will update that right now as fast as I can. 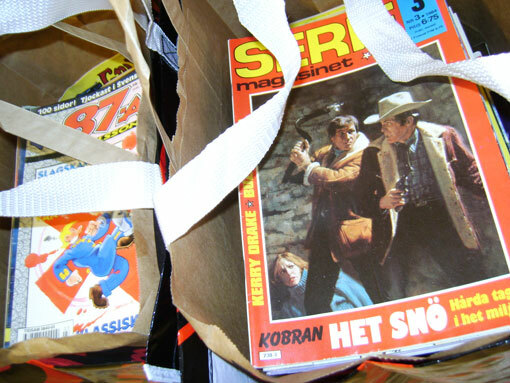 Carried several boxes and a couple of bags with old comic books to the basement today. As I go through this stuff I keep finding magazines that I thought was lost forever, or that I certainly have not seen in decades. Great fun. I will see this stuff again when I have that place in the countryside.